A trade association's complicated membership form moves online, simplifying things for affiliates and management alike. ANCOR is a trade association representing community providers of services to people with disabilities. When it was time for a website redesign, ANCOR brought in Balance Interactive to refresh the look and feel of the site. The design and build process sailed along, but there was one sticking point – ANCOR’s membership application. Because of our NetForum and Drupal integration experience, Balance called us in to build ANCOR’s complex affiliate form, which was complex enough to be prohibibitively expensive to implement in the AMS. Our approach was simple. We built the form in Drupal, where ANCOR could tweak text as needed. 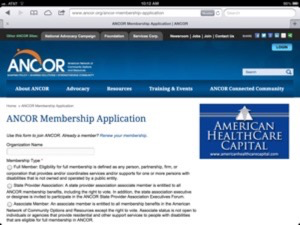 But the membership data is saved to ANCOR’s NetForum AMS database. Membership maintenance is then handled by NetForum. This approach plays to the strengths of each system – and it’s working well for ANCOR.